Cindy Delgado, assistant director for workers’ compensation, earned her certificate last year during the program's pilot run. 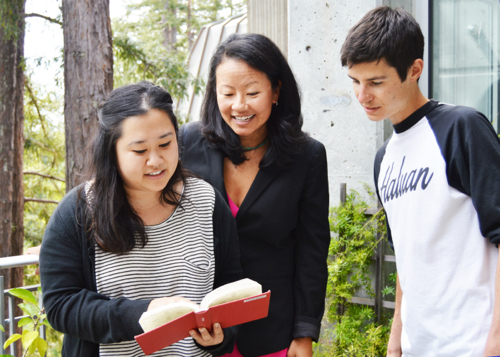 In a move to help the UC Santa Cruz community broaden and deepen the conversation around sustainability, the campus has launched a new seven-course certificate program for faculty, staff, and graduate students. The Sustainability Certificate Program, created by the Office of Sustainability, went through a pilot run last academic year and is preparing for a formal launch in fall. Registration will open Aug. 14 on the UC Learning Site. Sustainability Program Manager Shauna Casey said the office has long focused on providing practical advice: how to avoid creating trash, tips on recycling, tools for minimizing your energy demands, and more. The office, however, noticed a growing need to support campus employees in discussing sustainability in a deeper and more meaningful way. For example, when considering strategies to reduce greenhouse gas emissions in Santa Cruz, the solution of living closer to where you work is simply not possible for most people given the costs of housing compared to wages. Casey said the program was modeled after the campus’s lauded Diversity and Inclusion Certificate Program. To earn a certificate, participants must complete six required core courses and one elective within two academic years. The program is designed to take a holistic look at sustainability and not break it into specific topics, such as water, energy, or transportation, Casey said. Intersections Between Diversity & Environment explores how certain forms of environmentalism have perpetuated discrimination and helps participants consider ways to approach sustainability in a way that is more inclusive. The course is taught by Colleges 9 and 10 Provost Flora Lu, American Indian Resource Center Director Rebecca Hernandez, and Sustainability Office Director Elida Erickson. Professor Chris Benner teaches a course on sustainable cities and social equity that examines global patterns of urbanization and plans for developing more urban cities, particularly in California. UC Santa Cruz alumnus Kevin Koenig, Amazon Watch’s program director for Ecuador, and Chrissy Thomure, educational facilities planner, co-teach Climate Change and Justice, which looks at the global and local impacts of climate change, and the strengths and weaknesses of efforts in policy and technology to reduce greenhouse gas emissions. Last year, the course included a video chat with an Ecuadorian leader about climate justice in the Amazon rainforest to help bring more perspectives to the discussion. Other courses touch on sustainability within the University of California, sustainable leadership, and fostering sustainable behavior. New this year is Mindfulness and Sustainability, an elective course taught by Jeffrey Kiehl, an adjunct faculty member in Environmental Studies. Additionally, she noted that climate change stirs up grief in people who understand the scope of its impacts—and that mindfulness can be a tool to help people cope. More than 70 people participated in the program last year during its pilot run, and 13 earned a certificate. 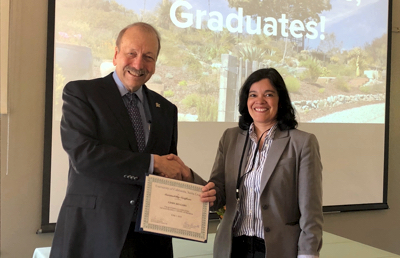 Cindy Delgado, assistant director for workers’ compensation, said she enrolled in the program after her office was re-evaluated by the Sustainability Office’s Green Office Program, earning the highest ranking possible after previously earning the second-highest level. “I know about UC Office of the President’s Carbon Neutrality initiative, and this seemed like the perfect next step,” Delgado said. The discussions and activities made each three-hour courses go by quickly, while also leaving her eager to share what she learned with the ten other people in her office. “My 'aha moment' was realizing how much additional energy is used to recycle products,” Delgado said. That frame of mind has made her think more deeply about the hidden energy costs that are involved with conducting university business—and approaches that can reduce or eliminate them. Can a meeting be conducted through video chat to avoid people needing to drive to a common location? Does a certain document need to be printed or can it remain a digital version?